A strange combination of two services. 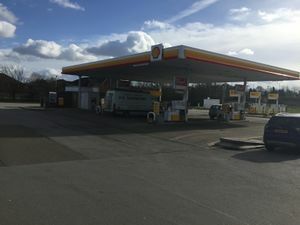 The official service area is the McDonald's and petrol station, but there is an additional Premier Innbook and Brewers Fayre positioned down an adjacent entrance, albeit at the end of a long driveway. The services as a Little Chef and Total. The original part of the service area was developed by Kelly's Kitchen and Petrofina in around 1989. Kelly's Kitchen became the West Lynn branch of Little Chef almost immediately. 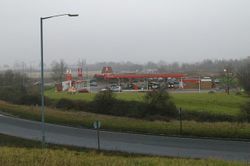 In 2012 it was deemed to be under-performing and closed, becoming the McDonald's after a while. Meanwhile there was another branch about two miles to the east. The King's Lynn branch of Little Chef opened about a year earlier, probably hoping to compete with Kelly's Kitchen. It lasted until 1996 when it was closed in favour of the larger West Lynn branch (although the King's Lynn branch was briefly brought back as a Burger King). The Petrofina became Total and then changed to Shell in December 2012.